Wildflowers are abundant in the Eagle Valley, whether hiking on Vail Mountain or one of the many trails throughout Eagle County you can’t miss them. Check out the guide below so you know what Wildflowers you’re looking at when you hike! Did you know we offer guided backcountry hikes where you can learn about the wildflowers and so much more? Click here to view the hiking schedule. Locally known as the caviar of the woods, due to the fishy taste of the leaves, bluebells can be found in moist to wet areas from the foothills to alpine areas. 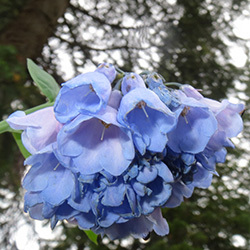 It is generally smaller than the Eastern species Virginia Bluebell, bluebells in the Central Rockies bloom from May through June and into July if conditions permits from the foothills (5,000ft) to alpine (11,000+ft) environments. Bluebells can also be referred to as Tall Lungwort or Chiming Bells. The leaves from bluebells can be used as a potherb but are generally too hairy for use in salads. 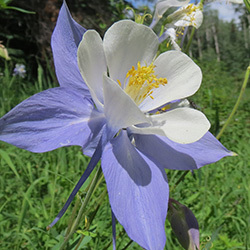 The commonly recognizable Blue Colorado Columbine is the state flower of Colorado and can be found in scree (rock) fields growing from the foothills to the subalpine zone (10,000ft). The Yellow and Red Columbine are usually found at lower elevations and generally bloom earlier than the Colorado Columbine although both bloom between June and August. The nectar in the slender spurs of these flowers can only be reached by hummingbirds or long-tongued moths. The Columbine name comes from the Latin Columbina, or dove-like, because the five-petaled flowers were believed to resemble 5 doves drinking from the blossoms! Most parts of the Columbine are poisonous and can cause stomach irritation if ingested! This easily recognizable flower blooms in the late summer and rapidly colonizes disturbed areas such as those that recently saw fire activity. Look for it along roadcuts on Vail Mountain and anywhere recent construction may have occurred. The pink blooms are a favorite of honey bees and Fireweed honey is a high-end product you can find in local markets. Legend has it that fireweed was the first plant to rebound in London after the bombing campaigns during World War II. Many teachers and students lament the blooms because it is said that once the blooms make their way all the way to the tip of the stalk, it is time for school to start! 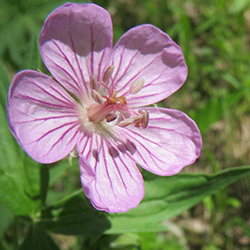 One of the more common species to be found in the valley, Geranium plants can be identified by the deeply lobed leaves (sometimes resembling oak leaves), and small, 3-5cm wide, flowers blooming between May and August. Found in drier areas, Geranium roots have been used for centuries as a coagulant to stop bleeding or to treat dry and chapped lips. The genus Geranium¸ is derived from the Greek, geranos, or stork because the long and slender seed pods are thought to resemble stork’s bills. 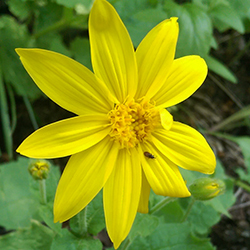 Easily mistaken for a sunflower, Arnica can be identified by the bright yellow blooms between June and August and opposite leaves that resemble hearts. All Arnica’s (and there are many species throughout the world) are poisonous when ingested yet the roots and leaves have been used for generations to make salves to relieve minor aches and pains. Extracts of the flowers were once even believed to make hair grow! Look for them from the foothills to the alpine zone in regions where they’ll receive plenty of sun. These red blooms can be seen from June to August on leafless slender stems and are also known as fairy trumpet or skyrocket. 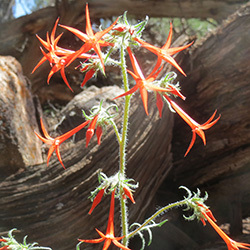 Scarlet Gilia are pollinated by humming birds. Their beaks become covered in pollen while eating nectar from the flowering tubes. Generally found in drier environments, Scarlet Gilia have a very skunky odor when crushed and can be used as a bug repellent. Mule deer common to the area love to snack on these flowers so keep your eyes open! 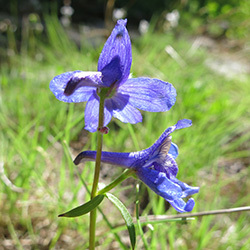 The namesake of the popular Vail restaurant, Larkspur can be found from the montane to alpine environments and is identified by the deep blue to purple blooms with an upper petal extended back resembling a spur blooming between May and August. 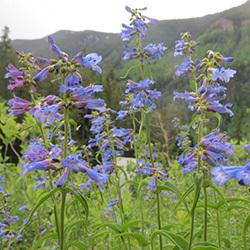 Contrary to the delicious food served in Vail, Larkspur are very poisonous and teas and alcohols have been derived from their seeds to kill lice and cure scabies. Powdered petals were once used in religious ceremonies by Native Americans as a sacrifice to the south because their color was sacred to tribes living in southern regions and are also known in the Eastern parts of the country only by the genus name, Delphinium. A member of the pea family, and also referred to as bluebonnets in Southern States, lupine are one of the most common wildflowers to see from the valley floor up to subalpine environments. Blooming from May to August, cultivated species of lupine can also be found throughout the village flower baskets. Although in the fall the seed pods closely resemble edible pea pods, the entire plant is considered poisonous and should not be eaten! 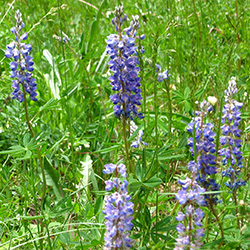 Recognize lupine by the “banner and keel” flowering formation common to all members of the pea family such as vetch, clover, locoweed. 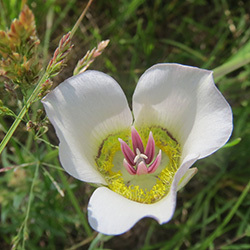 One of the rarer yet more beautiful wildflowers in the valley, Mariposa Lilies bloom throughout the summer at lower elevations. Mariposa, or butterfly in Spanish, Lily’s can be identified by the large 3 petaled blooms. Native Americans boiled the roots and bulbs to make sweet porridges and were even used by early settlers when food was scarce. Some species of Mariposa bloom in pinks and purples although the bright white flower is most common. Paintbrush flowers come in many different colors and sizes depending on location and elevation. Look for the yellow blooms in alpine environments and the pinks, oranges, and scarlets from the foothills to subalpine. Paintbrush are believed to have co-evolved with hummingbirds because the blooms are scentless and the sweet nectar can only be reached deep within the flower by hummingbirds or long-tongued moths. Paintbrush also have a special relationship with the native Big Sagebrush that are common in the area. A special fungus found only on the root systems of the sage is necessary for aiding the paintbrush to bloom. 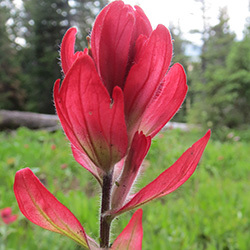 It is also important to note that the colorful blooms of the paintbrush are not petals, but are called bracts that hide the true flower of the paintbrush within. Identifiable by their 5 petaled blooms, penstemon always have 2 petals on the upper part of the blossom and 3 below, resembling a pentagon. 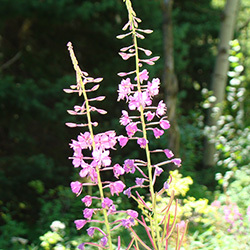 The three species native to the valley bloom in shades of blue, purple, and pink in May through August and generally can be found from the foothills to alpine areas. Leaves and stems from Penstemon can be used, in moderation, to make teas and there are many cultivated varieties that are bought and sold at local nurseries. Because it is a common garden plant, identifying individual species can be difficult due to genetic cross breeding. Always remember 2 petals on top 3 on the bottom!